Form 4107 is a California Franchise Tax Board form also known as the "Mandatory E-pay Election To Discontinue Or Waiver Request". 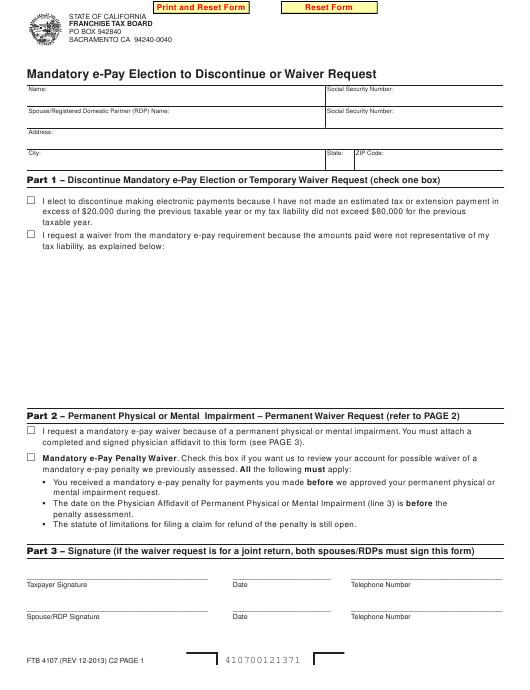 The latest edition of the form was released in December 1, 2013 and is available for digital filing. Download an up-to-date fillable Form 4107 in PDF-format down below or look it up on the California Franchise Tax Board Forms website. completed and signed physician affidavit to this form (see PAGE 3). • The statute of limitations for filing a claim for refund of the penalty is still open. the original affidavit signed by your physician. Keep a copy for your records. impaired and become unable to use a computer? and correct to the best of my knowledge and belief under penalty of perjury.